PhD, Rutgers University, New Brunswick, N.J.
MS, Rutgers University, New Brunswick, N.J.
BA, University of Virginia, Charlottesville, Va.
Dan Baugher, Ph.D. is Professor of Management and Associate Dean for Graduate Programs. Prior to this role, he served as Chair of the Management and Management Science Department for 14 years and as Director of the Hotel Management Program for five years before his election as chair in addition to serving as University Research Design and Statistical Consultant for more than ten years. He received the Pace University Kenan Award for Teaching Excellence at its 2011 commencement, the Lubin Innovation in Teaching Award in 1998, Best Journal Article Award from Decision Sciences Institute in 2003, and Best Case Award from the Eastern Academy of Management in 2010. Before joining Pace, he was an Assistant Professor at Rutgers University where he taught applied psychology to life inmates at Rahway State Prison and intro psychology to hundreds of students in large lecture sections. He served as a clinical intern at The Carrier Clinic in New Jersey working with suicidal patients under the supervision of J.R. Wittenborn, Ph.D. and Arthur Sugarman, M.D. He also served as a psychometric intern in the legendary AT&T Human Resources Research Laboratory in Manhattan where he evaluated the success of training programs and developed entrance tests and job analyses for the Bell System at its peak employment of one million employees under Mary Tenopyr, Ph.D., Robert Ramos, Ph.D. and Richard Riley, Ph.D. He has published management computer simulations for Random House and McGraw Hill in his text, PC Case, created video case studies in intro management for McGraw Hill, and spreadsheet-based cases in strategy for SouthWestern Publishing. 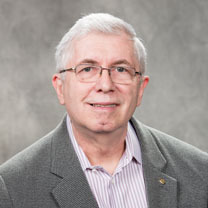 He has served as a c-suite consultant since 1973 beginning with research on management selection for Hardee's Food systems for its nationwide chain of restaurants. In 1993-94, he created the $1.9 billion business plan for expanded use of the NYC MetroCard for Nippon Telephone and Telegraph and evaluated the impact of the new medium on user subway turnstile throughput in a study of 14,000+ riders, published in the National Academies of Sciences Journal, The Transportation Research Record in 1996, shortly after implementation of the MetroCard in the city. He continues to serve as a consultant to the New York State Division of the Budget where he created its top management promotion system and worked on Governor Mario Cuomo's Comparable Worth Initiative. He has also worked with the NYS Dept. of Taxation and Finance using big data analytics to determine who to audit. Other clients have included among others, the CBS board, AT&T, AT&T International, NJ Transit, NYC Health and Hospitals Corporation, Fragomen, DelRey, and Bernson (a major immigration law firm), NYC Board of Education, Ardsley Partners (a $1 billion equity-based hedge fund), NYS Office of Mental Health, NYS Office of Mental Retardation and Developmental Disabilities, Park Evaluations (an immigration support firm), Citibank, Security Capital Real Estate Fund, American Express, MetLife, the Port Authority of NY and NJ, Li and Fung in Hong Kong, and Yale University. He has served as track chair in management for the American Society of Business and Behavioral Sciences (ASBBS) for the past 20 years. He has received a number of best paper awards from ASBBS as well as its outstanding scholar award in 2010 and outstanding service award in 2003. In 2000, he gave the keynote address at the Association of Business Simulation and Experiential Learning (ABSEL) on Using the Internet in Business Education. His most recent three journal articles, published in 2016, focused on the validity and reliability of online product quality ratings of movies and DVDs by users on Amazon and Netflix. He has also served as residential condo president and treasurer for the Landmark American Tract Society Building in Manhattan since 2003. He has been heavily involved in curriculum development at Pace including the creation of the hotel management program (now called hospitality), the UG HRM program, the Graduate HRM program with Dr. Ibraiz Tarique, the EMBA with Drs. Andrew Varanelli and Jim Hall, and the FastTrack MBA program. He teaches intro mgmt., OB and change (EMBA), and a doctoral seminar in research methods and has taught a range of other courses including human resources management, business strategy, leadership principles and practices, management seminar, hotel design, housekeeping, maintenance, and engineering functions, and organizational behavior. Baugher, D., Weisbord, E., Tarique, I. (2010). The relationship between prior work experience quality and job performance for financial analysts seeking promotion in state government: A 15-year study. Journal of Business And Behavioral Sciences. 22(1), 51-61. Baugher, D., Varanelli, A., Weisbord, E. (2003). Relating group diversity to group performance in a business game: Some findings for ancestral diversity.. Journal of Business And Behavioral Sciences. 10 (1)27-36. (1997). PC Case Business Case Software in True Basic. Baugher, D. (1987). PC Case Basica Software Modules.